From any recent study of New York the visitor from another planet would conclude that our observance of Christmas consisted chiefly in unusual practice and encouragement of the art of shop-keeping. 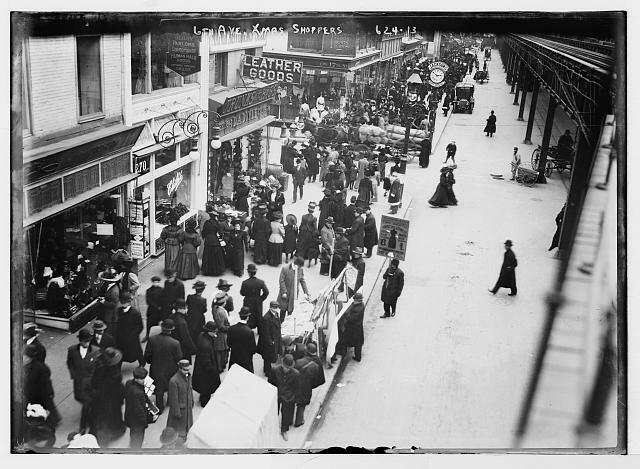 Broadway and the other shopping streets have been for many days a vast fair, crowded with customers till long past the dinner-hour, and late at night, no doubt, the shopmen went out and bought from each other, for there is no resisting the contagion. When one has bought what he desires, there is a fine pleasure in leisurely strolls through the shopping quarter. 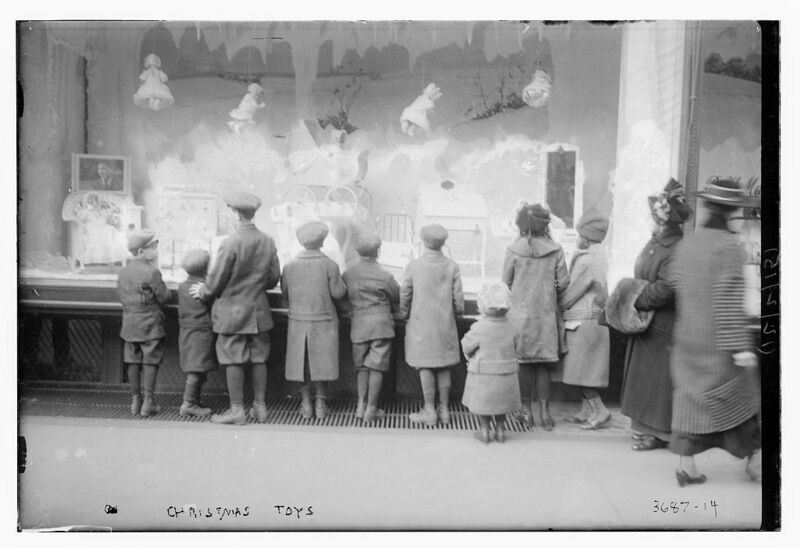 Late 19th century and early 20th century images depicting Christmas in New York from the Library of Congress collection can be divided (roughly) into two types: those showing activities related to charities (Salvation Army, soup kitchens, orphanages, et al) and those showing shoppers on the street. There’s a little shop half a flight up, on Fortieth Street, in New York, whose windows are always especially attractive—one of those upstairs apparel shops with all manner of dainty things. A neatly lettered card in the window suggests in a businesslike yet friendly manner that the “window shopper” come in and look around. “We thank you for stopping — for stopping to look at our display of merchandise We hope that it pleased you, and if you are anxious for further information, come inside. If you are not ready to buy, thanks anyway for stopping,” reads the card. “Thank You Card,” The Spatula, June 1921. 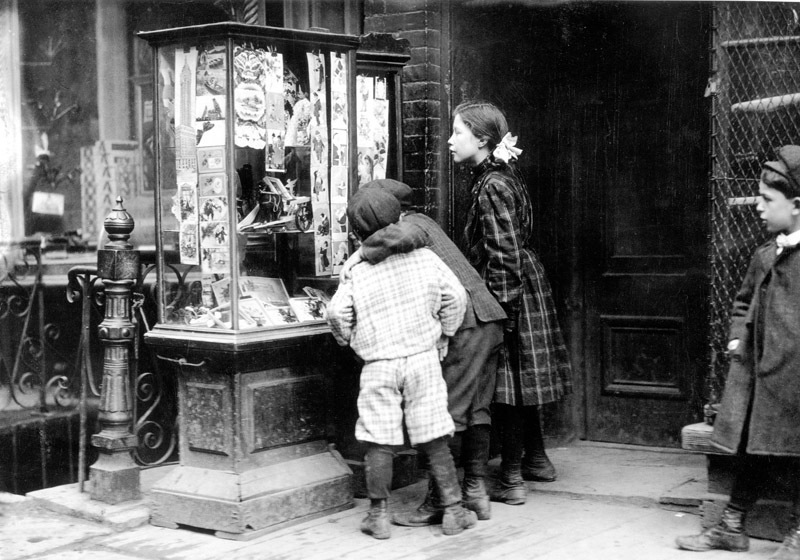 The practice of displaying goods in shop windows for passers-by to view was an invention of the mid-19th century. Harry Gordon Selfridge (of Chicago’s Marshall Field Department Store and later founder of Selfridges in London) is often touted as the first to use large window displays. 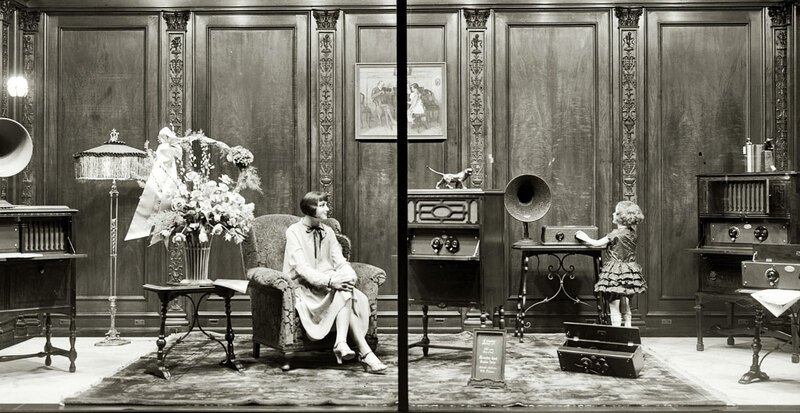 It took time before many merchants recognized the valuable advertisement that a store could broadcast through a window pane, but once they did, window displays became ever more prominent and elaborate. Soon, they would even be lit at night. “I have frequently seen men and women too, who were window shopping before my place at night inside the next day. 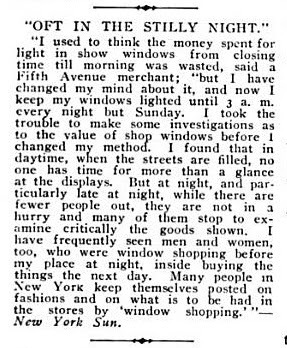 People in New York keep posted on the fashions and on what is to be had in the stores by ‘window shopping.’ ” (Trade: A Journal for Retail Merchants, 1908). Women in particular were targeted by shop keepers through the window display. Women, it was argued, “can either ‘window shop’ or ‘window wish’ without embarrassment. There are no clerks to ask her this or that until her mind is made up. 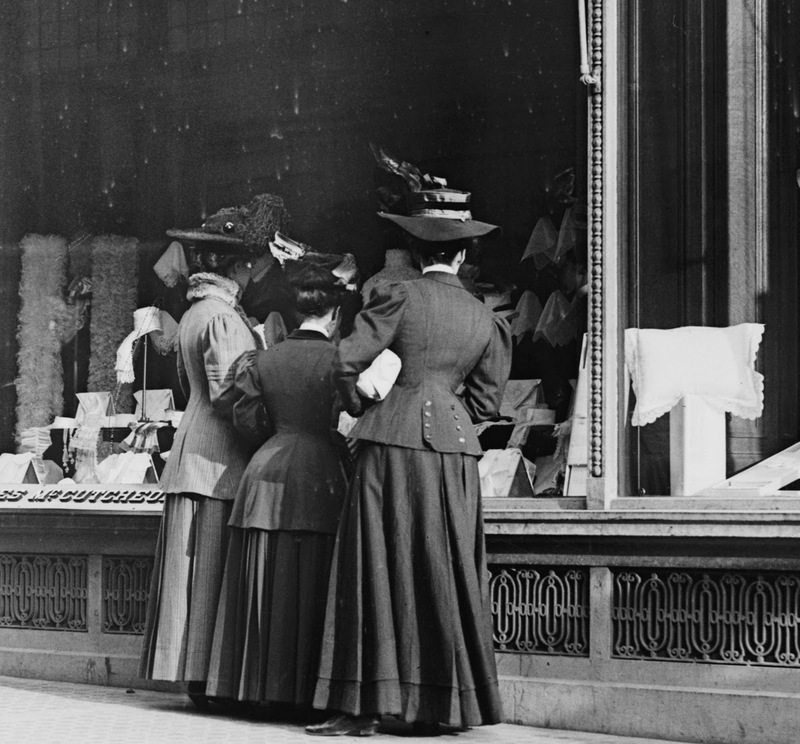 Women are guided and influenced by window displays, I believe, in fully 80 per cent of their purchases,” A.G. Sten, “Why Show Windows Appeal,” The Dry Goods Reporter, 1912. As the modern consumer looked through the window pane of glass, she could reflect on the goods displayed. But she also engaged in an act of self-consciousness, reflecting an image of herself onto the display–imagining a longing that could be fulfilled by what was available, imagining a “need” that could be met through a purchase. 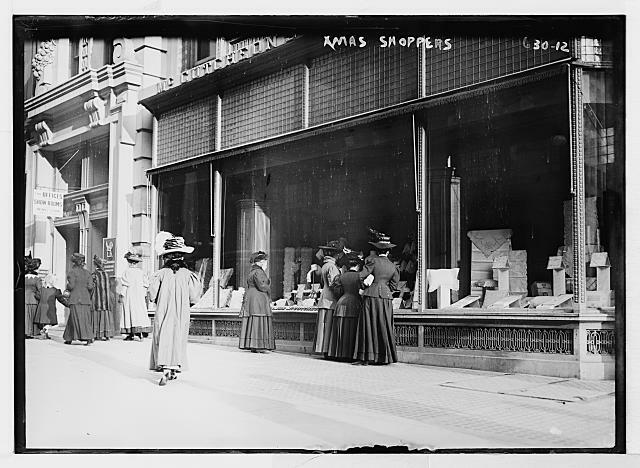 James McCutcheon’s Department Store (pictured above) was located along the aptly named “Ladies Mile” on Fifth Avenue. Its large windows seemed to open up to stage settings, where a world of dreams was laid out. You too can dream about some of McCutcheon’s erstwhile products, a few of which are now in the Metropolitan Museum. See one here. While the window shopper could lose herself in fantasy or reverie, she could, of course, also stir feelings of insufficiency, especially if she did not have money to fulfill the “need” she recognized (or created) through window shopping. That feeling, that pit in her stomach, was now also a reminder of an absence that she might never have recognized without seeing these displays. This was, of course, part of the psychological dance prompted by a society based on consumption. To buy something that somehow could help make life better, easier, happier, prettier, nicer, cleaner, etc. is an act of hope. And to deny that purchase left that emptiness. The longing would remain. 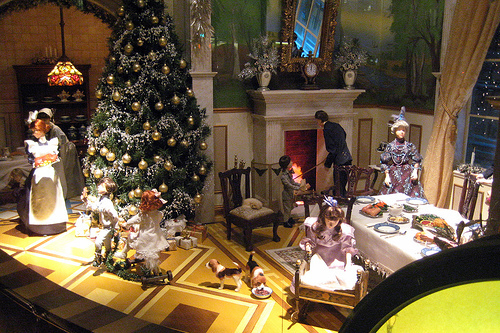 As techniques for enticing shoppers into stores through window displays became ever more sophisticated, numerous “experts” on the subject of window displays emerged, giving out advice to merchants. See, for example, “Why Some Windows Fail to Attract,” in The Underwear & Hosiery Review, September 1921). These experts reveal the fact that the shopper herself was now quietly being observed. Those who hoped to entice her into a purchase were mapping her behavior, deploying the newly emerging “science” of measuring and orchestrating the habits of consumers, based in part on psychoanalysis and brought to famous use by New Yorker Edward Bernays (who was loosely related to Sigmund Freud). 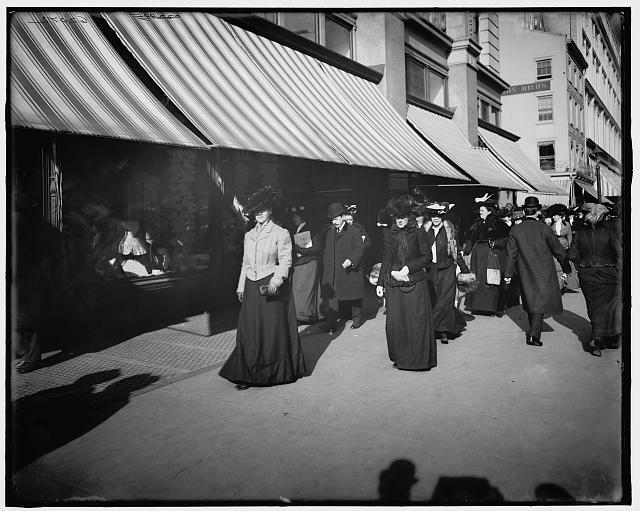 In the photograph above, the fact that shoppers were now being keenly observed is suggested in the visibility of the photographer’s shadow in the foreground. The woman looks at the photographer, peering out from under her broad brimmed hat, catching the act of observation. (And in fact, in all the images here, the act of observation is present, even if it is not recorded within the image itself). In the photograph above, the card seller (and the boy behind him) look into the camera lens. The card seller stands in front of his display and confronts the photographer with a steady gaze, as if to ask, what are looking at? 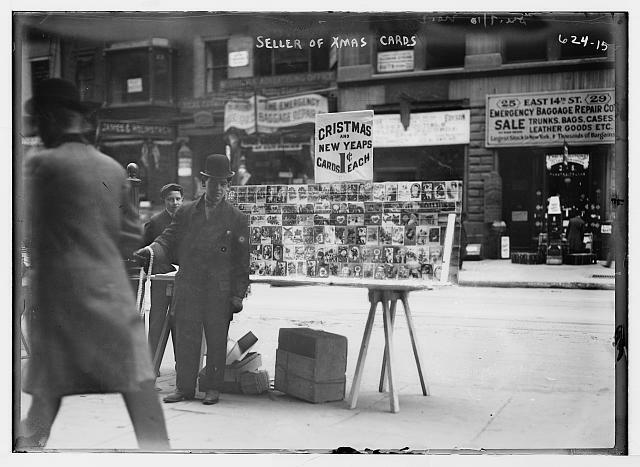 As a street merchant, the card seller has no store window, per se, but his method of confronting potential buyers on the street by stopping them in their tracks was a precursor to the modern window display. Only a thin pane of glass separates you, the window display suggests, from all your heart’s desire! 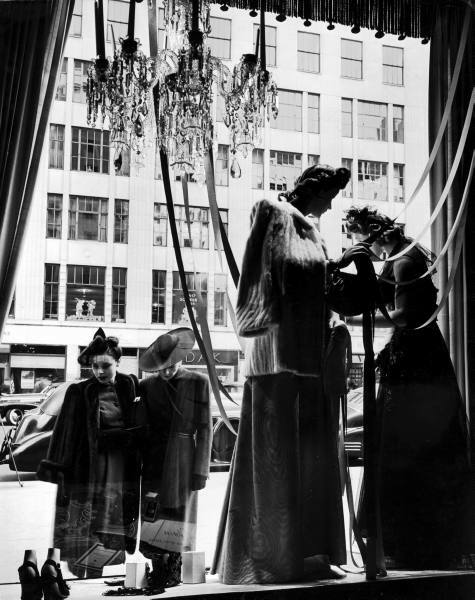 “They’re watching you,” Bergdorf Goodman, NYC, 1947. Today, the window display has become ever more sophisticated psychologically. We are now confronted everywhere by advertisements, screens, images, flashing promises, and reminders of unfilled needs. 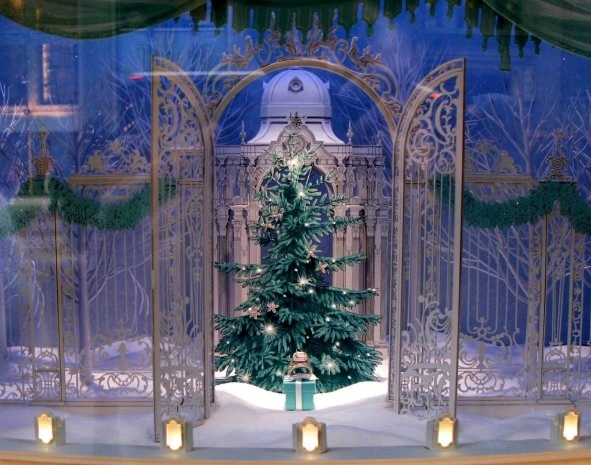 Lord and Taylor window, NYC, 2007, Christmas, old school. The window display is now a kind of meta-display, referring to an earlier time (above) or stripping down the “image” (below) to serve us not a Christmas goose, but a dazzling and amorphous reminder of something we just might need….now or in the future. Just This: A Modern Reminder, Tiffany and Co. Window, NYC.